Open Systems Interconnection or OSI model was first proposed by International Standards Organization (ISO) to solve the multiple problems faced in telecommunication. It is a conceptual model of telecommunication networking where the whole process is divided into seven effective layers. It synchronizes the whole process and helps one understand the inter operation of the diverse communication system under the standard protocol. The seven layers we are talking about are abstraction layers and each layer is connected to either one or two layers depending on its position. The interlinked layers serve one another to forward the communication process. Brief description of each OSI Layers. 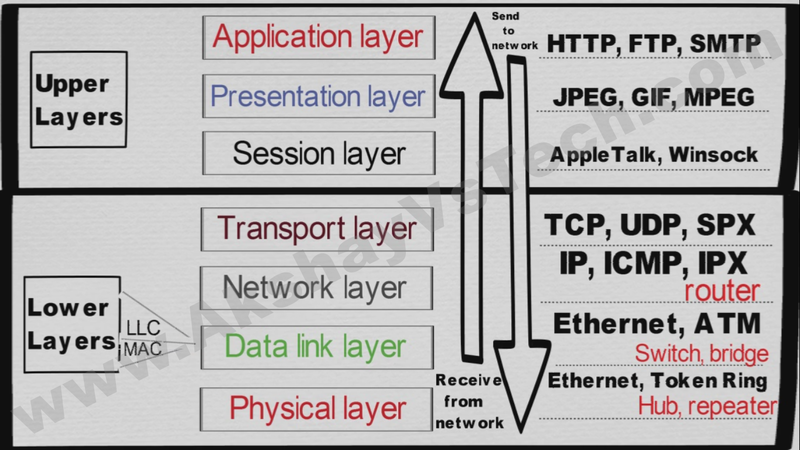 This layer is the primary layer of the OSI model and consists devices such as Ethernet cable, Token ring, hubs, repeaters and electrical specification for data connection.This layer responsible for connecting the device to physical transmission medium such as copper or optical cable or radio frequency or pulses of infrared. When operating at the physical layer, the data is transmitted through electric voltage, radio frequency or pulses. Data link layer encodes and decodes data packet into bits and using its transmission protocol it handle errors in the physical layer. It also controls flow and synchronization of the frames and the same time it manages controlling access of the physical layer network devices. While MAC determines how the computer in the network will have access to the LLC layer, the LLC layer works in the frame synchronization. The Network layer adds the concept of routing above the Data Link layer, When data arrives at the Network layer, the source and the destination addresses contained inside each frame are examined to determine if the data has reached its final destination. If the data has reached the final destination, this Layer 3 formats the data into packets delivered up to the Transport layer. In layer 3 logical paths is created for data transmission through network devices such as switch and routing devices. This works for transmitting data from one node to another. Addressing, routing and forwarding are the three major functions at this layer. to support routing, the Network layer maintains logical addresses such as IP addresses for device on the network. The Network layer also manages the mapping between these logical addresses and physical addresses. In IP networking, this mapping accomplished through the Address Resolution Protocol (ARP). In the fourth layer, variable length data sequence has to be transferred from source to destination host through one or ore network. This Transport Layer delivers data across network connections. The transport layer is to be delivered the entire message from source to destination, & receiving without any errors. Different transport protocols may support a range of optional capabilities including error recovery, flow control, and support for re-transmission. The supported protocols for this Layer are TCP (Transmission Control Protocol), UDP (User Datagram Protocol) and SPX (Sequential Packet Exchange -Noveil Netware Operating System). In the Session layer, communication or connection between computers is controlled in a managed environment. I has the stole capacity of managing & terminating connection & helping in establishing connection between local & machine applications. At layer 5, It is built to support multiple types of connections that can be created dynamically and run over individual networks can be controlled through the year. 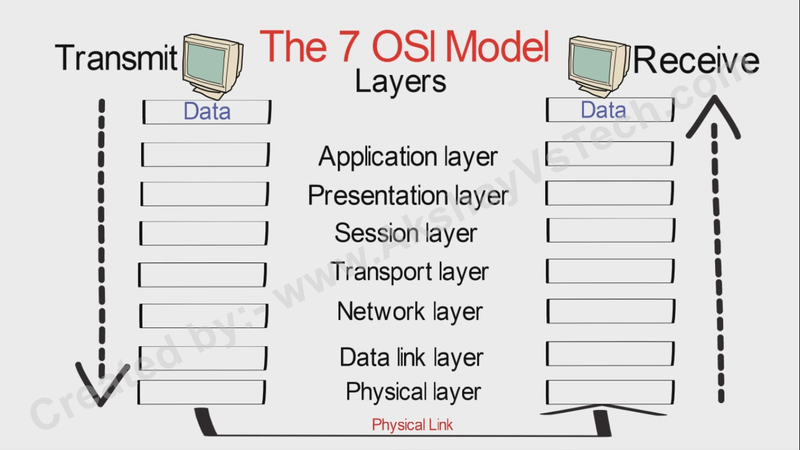 The Presentation layer is the simplest in function of any piece of the OSI model. At layer 6, It handles syntax processing of message data such as formats conversions and encryption/ decryption needed to support the application layer above it. This layer is most simplified layer in the OSI model where data segregation is done based on the file type. Data can be classified in 4 types as ASCII- text format, Audio format, Picture format & Video format.The major job oh this layer is to translate between application & network format. This is the last layer of OSI system and this layer represents the data that is understood by end user. The Application supplies network services to end user applications. Network services are typically protocols that work with the user data. For Example, in a Web browser application, the application protocol "HTTP (Hyper Text Transfer protocol)". In this layer user interacts with the software application & communicating components are implemented. In this layer communications partners are identifies along with quality of service.